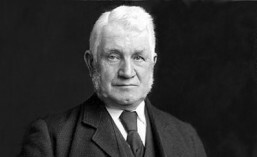 William Arrol established his boiler -making business at the Dalmarnock Iron Works in 1872. It was an ideal location close to a large labour force and with canal and rail links for transporting his iron and steel constructions around the country. The company started out making boilers and soon progressed to girders. At the time, the industrial revolution was at it’s height and the railway network was rapidly expanding. This offered many opportunities for a boiler-maker and bridge-builder. The success of the company was based on it’s ability to take an engineer’s designs and implement them on a practical level, overcoming physical and environmental barriers to construction. They came up with solutions to bigger and more complex projects, devising new efficient ways of working and yet maintaining a high standard of workmanship. As the company’s reputation grew, the size of the projects it tackled grew, from the 60 foot spans of bridges over the Water of Leith to 200ft spans of the Caledonian Railway Bridge and ultimately the largest, the 1730 foot spans of the Forth Bridge. However, the constructions of Sir William Arrol & Company didn’t stop at bridges. They also built workshops, cranes and other manufacturing equipment. See Arrol Stuctures for a chronological list and further details about the notable structures built by the company during Sir William Arrol’s lifetime. One of William Arrol’s earliest contracts in 1872 was to build railway bridges across the Water of Leith for the Edinburgh to Balerno line. Arrol’s reputation began to grow and in 1875 he was contracted by the North British Railway Company to build a railway bridge over the River Clyde at Bothwell and the Caledonian Railway Bridge over the River Clyde on the approach to Central Station in Glasgow. The company learned from the experience of each project and developed new methods for construction over longer distances, ways of sinking foundations deeper underwater and specialist tools were developed for a variety of tasks. When the original Tay Bridge collapsed in December 1879, tragically taking 75 lives, the nation was shocked and public confidence in iron bridges was lost. When William Arrol & Company built the replacement Tay Bridge it had to undergo rigorous testing to demonstrate that the new bridge was safe. The workmanship was found to be of a very high standard and Arrol’s abilities were widely praised. By this time William Arrol & Company was already 5 years into the construction of the Forth Bridge. This was to be the largest undertaking of Arrol’s career and the pinnacle of his success. It brought the Company worldwide recognition and contracts started flooding in for work overseas, as well as the UK. Sir William Arrol & Company built hydraulic and electric cranes to fit a variety of purposes, from supporting heavy manufacturing tools to moving massive loads. Depending on use the load bearing capacity could range from 5 to 150 tons and the lift height from 5 to 120 ft. 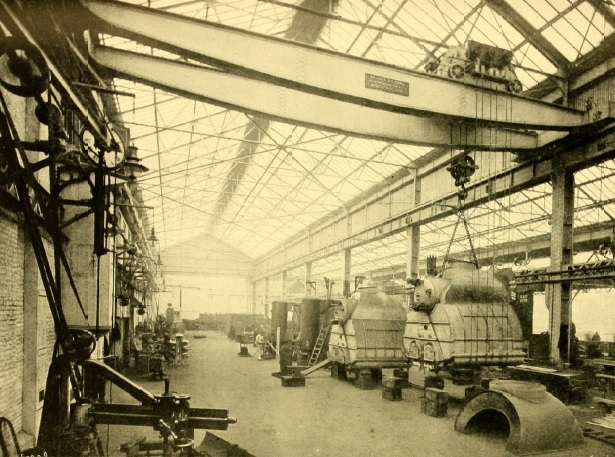 Some cranes were built into workshops but others were operated outside and had to be self-supporting and able to withstand loads and exposure to weather. Tall cranes, in particular, were vulnerable to the augmented forces caused by operating in windy conditions. The cranes also had moving parts which had to stand up to grinding and shearing forces and be protected from corrosive elements of the air. The most famous crane Sir William Arrol & Company built, the largest of it’s time, is the Titan Crane, for John Brown & Company Ltd at Clydebank. It is a gigantic cantilever crane, known as a hammer-head, of 15o ton capacity,designed for moving heavy components like boilers and turbines for shipbuilding. Examples of cranes built by Sir William Arrol & Company Ltd. Traditionally workshops had been built with masonry and timber, resulting in very dark interiors. The introduction of steel structures with glazed roofs offered the robustness of the old buildings but were brighter and better ventilated, providing much better working conditions. It was important that the steel columns and girders of these workshops were strong enough to withstand the stresses and strains placed upon them. External pressures came from buffeting by wind and weight of lying snow and variable temperatures meant the metalwork was in constant state of expansion or contraction. Internal stresses were also placed on the structures, particularly through the use of cranes which were supported by the columns which also supported the roof. As well as the vertical pressures from lifting heavy weights, if a crane stopped or started suddenly it would cause a horizontal shift. 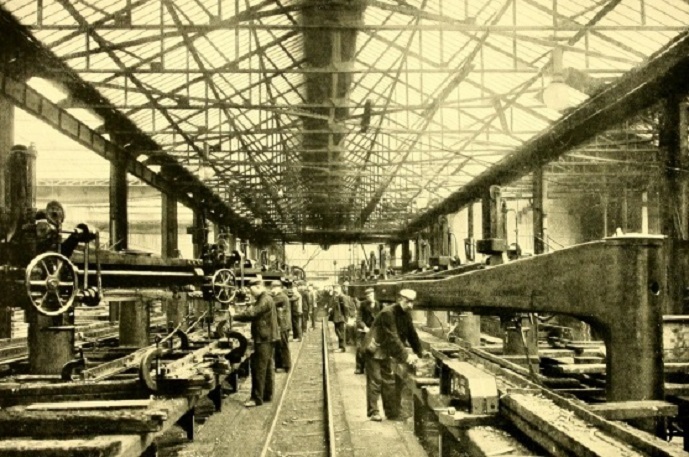 William Arrol & Co Ltd were skilled at designing structures to withstand all of these bending and shearing effects and built their own new workshops onsite at Dalmarnock and for other companies including: shipbuilders Yarrow’s, John Brown & Co., Harland & Wolf; and Guiness brewers. By 1910 the Dalmarnock Iron Works covered a site of 17 acres and employed almost 2000 men onsite and thousands more on location at construction sites.